Last weekend was the epitome of the perfect Spring weekend. Saturday was kicked off with a trip to the farmer's market, where a lovely assortment of spring greens, asparagus, green onions and fresh eggs were purchased as we browsed the stalls, cup of coffee in hand. After that was strawberry picking in the country, where Brian and I desperately tried to find enough perfectly ripe berries in the sea of green-tipped adolescents to make our 25 minute drive worth it. Apparently the field had been picked clean by a gaggle of girl scouts the weekend before and hadn't quite recovered yet. Now I have nothing against girl scouts, but when they clean out the strawberry field I am left with a few bitter thoughts in my head. If you've been reading for awhile, you'll know that Virginia's strawberry season is short and I look forward to it all year long. Luckily my momentary bitterness was nothing a strawberry frozen yogurt and a trip to the reservoir to let the dogs swim couldn't fix. On Sunday we continued our celebration of spring weekend by grilling out with friends. Brian has been working to perfect ribs on our Big Green Egg grill for a year now, with a long hiatus in the middle for those cold winter months. We thought that this weekend was going to be it, the moment when the ribs would come off the grill after spending hours smoking over low heat, perfectly moist and fall-off-the-bone tender. I anticipated telling you all about them and had their post written in my head. It was going to be so perfectly coincidental that our first attempt at ribs on the Big Green Egg had been exactly one year prior, on the weekend of my graduation from UVA's M.Arch program, and that exactly 12 months of debates and research and a dozen racks of ribs later I would be sharing with you the perfect rib recipe. Sadly, it isn't so. While their flavor was delicious, as it always is, the tenderness of the ribs just wasn't where Brian wants it to be. We'll get there, I promise, and you all will be the first to know - after we call all of the friends whom we've been experimenting on to gleefully tell them that we have finally mastered ribs on the Big Green Egg and to please, please, stop by for another taste-test. 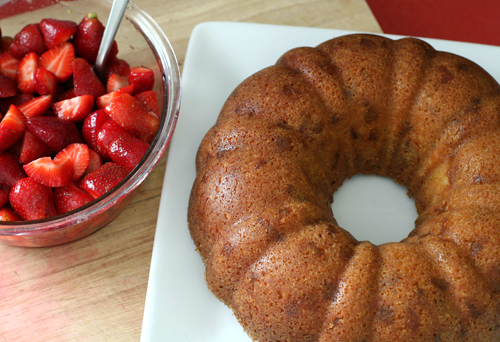 Until then, a recipe for ginger bundt cake with ginger-infused strawberries will have to do. And it will do, I promise, because here's the thing about this cake - it. is. delicious. 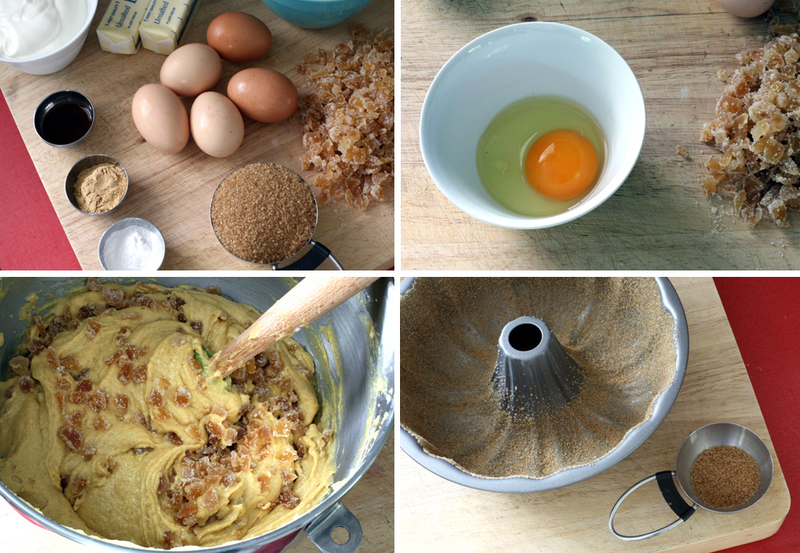 I knew it would be a success as I was blending the farm-fresh eggs into the batter and it was turning the beautiful golden color you see above. 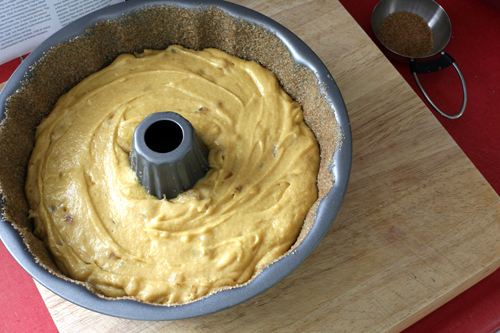 The texture was just what cake batter should be, and the color given to it by those vibrant orange egg yolks (which you just can't get from grocery store eggs) was so beautiful that I did a little dance after each addition. The ginger-infused syrup for the strawberries is so perfect that I can't help but think of cocktail recipes that will utilize it all summer long. This cake fits right in at the backyard barbeque, nestled in between ribs on the grill and the last few games of Baggo. 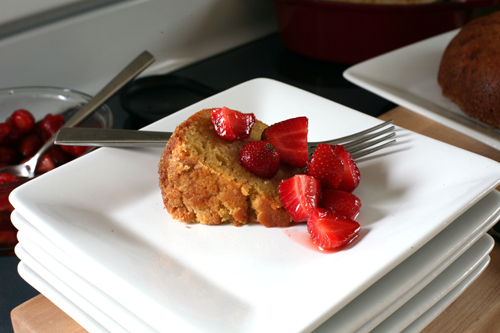 It has a consistency similar to pound cake, and if you choose to forego the strawberries one could easily eat a piece with their hands without it crumbling to bits. This would be very helpful if a second serving were desired after the backyard games had begun, which is not unlikely. I hope you'll give it a try this Memorial Day weekend, and if you do, be sure to save some for the next day. 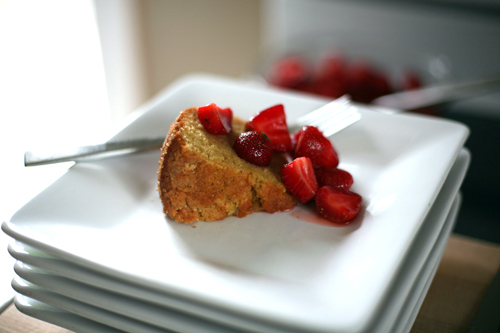 For as good as it is on a sunny afternoon piled high with gingered strawberries and accompanied by a glass of white wine, its even better with coffee the next morning. Trust me, it will do. 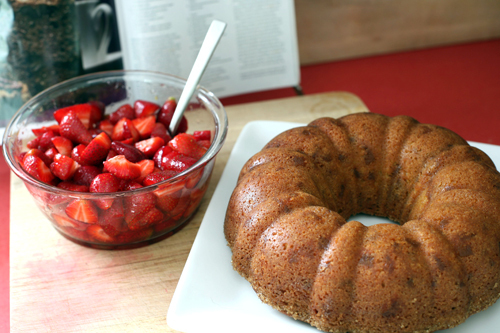 The recipe for Double-Ginger Sour Cream Bundt Cake with Ginger-Infused Strawberries can be found here, or in the April 2009 Bon Appetit. The turbinado sugar I dusted on the inside of the bundt pan didn't stay crystalized like the pictures show in the magazine. Instead the sugar melted and formed a perfect crust on the outside of the cake. We loved it. I substituted white whole wheat flour for the all-purpose and it was delicious.